Peter Bille is a senior lecturer in the Department of Food Science and Technology of the University of Namibia teaching dairy and food science and technology subjects. He has been teaching and researching in Namibia for the last 12 years. 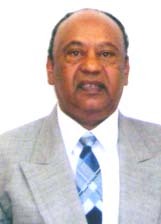 Prior to that, he spent ten good years as a lecturer in dairy science and technology at Egerton University and a part time lecturer at the University of Nairobi, Kabete Campus in Kenya. 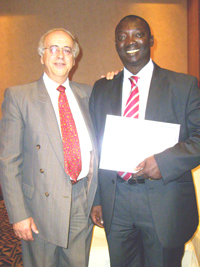 His research focuses mostly on technology, nutrition and value addition of traditional food products including milk, meat, fruits and vegetables and he has published a number of papers in the Journal of food technology in Africa (JFTA), African Journal of Food, Agriculture, Nutrition and Development (AJFAND), International Journal of Food Science and Technology (IJFST), Irish Journal of Food Technology (IJFT) and Milchwissenschaft. Bille has a Diploma (credit) in dairy technology from Egerton University, Kenya, BSc (Hons) in dairy/food science and technology from California State University, USA, MSc degree in dairy/food sci. & tech. from Queens University of Belfast, UK and he is a final year (2008) PhD student of food science and technology at the University of Pretoria, SA. He is the author of over fourteen refereed journal articles and he has published one dairy manual for students and industry titled, “Dairy Science and Commodity Processing Handbook: Practical Guide for Students and Industry (2005)”. Other booklets are just teaching materials for other aspects of food science and technology including quality and safety of foods for consumers. Bille has served as a consultant for some agencies, including FAO, Ministry of Agriculture and Forestry in Namibia and Centre for Research Information Action in Africa-South Africa Development Consulting (CRIAA SA-DC). 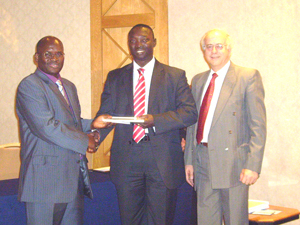 He has worked in Tanzania, his home country, Kenya and now in Namibia. Currently he is serving as a reviewer for AJFAND papers related to food science and technology. Billie is one of AJFAND’s most dedicated reviewers.His support is most appreciated. 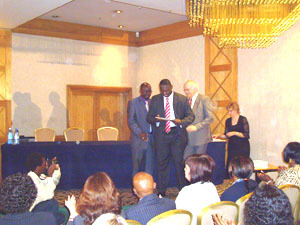 Dr. Emmanuel Ohene Afoakwa received the Award for Best Scientific Publication as well as a prize of €1,000.00. 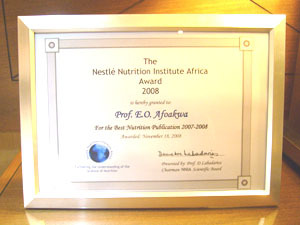 The Award was bestowed on Dr. Afoakwa, from the Department of Nutrition and Food Science, University of Ghana in Accra, Ghana for his contribution in the work entitled "Effects of tempering and fat crystallization behaviours on microstructure, mechanical properties and appearance in dark chocolate systems", which was published in the Journal of Food Engineering. In this work, Dr. Afoakwa and his colleagues explained how variations in particle size distribution and crystallization of triacylglycerols (TAGs) in cocoa butter could be manipulated to influence the crystalline network microstructure, mechanical properties and appearance of products during industrial chocolate manufacture. Understanding these factors has led to increased knowledge in predicting changes in finished chocolate quality as well as stability of its sensory character through the supply chain - production, storage, distribution and ultimately in consumption. These findings have significant commercial implications on the global confectionery industry.